Consumers are increasingly interested in using the tools they have on hand — food, exercise, sleep and their personal network — to create a sense of wellness in their lives, and the consumption of whole, real, minimally processed foods like whole grains is seen as especially critical in today’s wellness culture. Consumers feel that these inherently functional foods provide essential nutrients, energy, etc, without some of the drawbacks of more scientifically modified foods. Ancient grains are sought specifically because their heritage and uniqueness cue whole, fresh and less processed — all qualities that consumers consider key to improving digestion and overall health and wellness. Interest in less processed and more novel carbohydrates has had significant influence on diet trends over the last 20 years, and consumer understanding of grains spans the breadth of lifestyles in terms of engagement with wellness. Among less engaged wellness consumers, grains have a broadly constructed association with certain food categories (e.g., bread, rice, crackers, cereal). More engaged wellness consumers can identify grains as specific crops and ingredients. 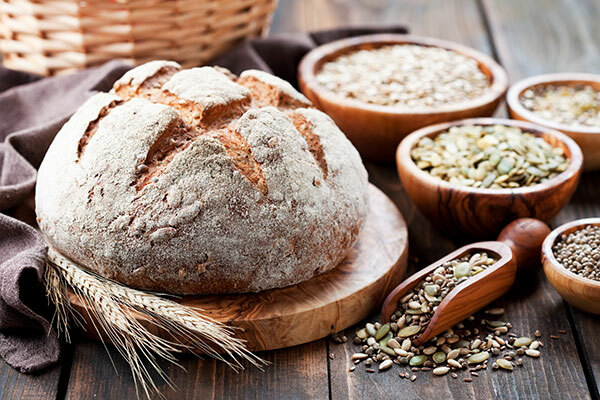 The most engaged, progressive wellness consumers can articulate more varieties of grains and their wide range of applications, nutrition, flavor and sourcing. Dietary approaches undertaken as part of wellness regimes reflect interest in adding fiber and whole grains as well as incorporating diversity into diets. 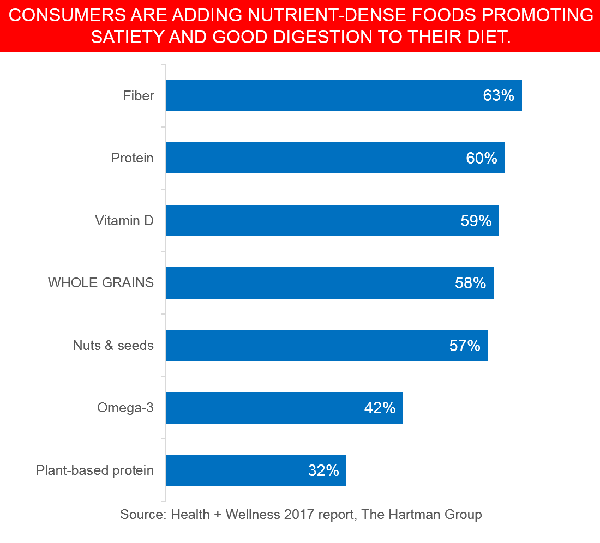 Our Health and Wellness 2017 report found that 63% of consumers say they’re seeking more fiber in their diet, 58% say the same about whole grains and 32% say they are seeking plant-based proteins. Other trends driving an interest in whole and ancient grains find that as consumers continually reexamine the role of grain in their diet, their interests in mindful sourcing have them asking meaningful questions about the origins of their food and linkages between agricultural methods, sustainability and wellness. Progressive wellness consumers are increasingly showing interest in farming practices that restore, rather than deplete, soil health. Changes in how consumers eat today are also influencing consumption of ancient and whole grains: with over 50% of meal occasions now defined as snacking, consumers are expecting more from snacks in terms of digestion, fiber, satiation and even energy. Such expectations pale in comparison to how snacks in the past might have filled a role as a “treat.” Within snacking and the rise of premium attributes, the premiumization of the most basic pantry staples like crackers reflects the fact that for manufacturers, appealing to a healthier snacking culture requires innovation that highlights ingredients and methods of processing. The cracker category has upgraded products with unique flour alternatives that go beyond gluten-free analogues. For the latest data and insights into this trend — and more — get Health + Wellness 2019. New syndicated research fielding Q1 2019. Click here for overview and order form.